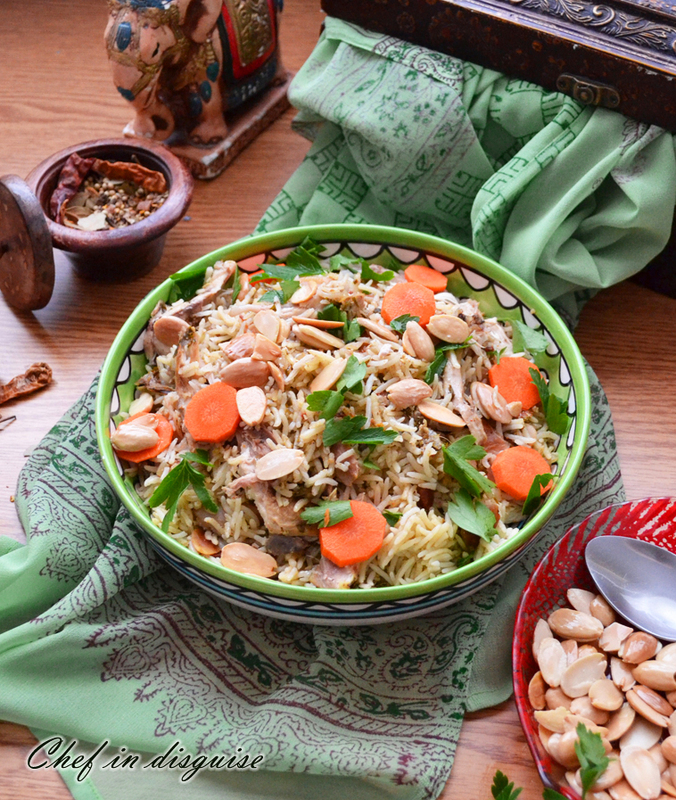 This month’s daring cooks challenge was about Biryani. Biryani is a rice-based dish made with spices, rice (usually basmati) and chicken, mutton, fish, eggs, or vegetables.The name is derived from the Persian word beryān which means “fried” or “roasted”. This was my second time making Biryani and my first time making chicken biryani (the first was meat biryani). In my first attempt I used a ready made biryani spice mix that turned out to be too spicy. We couldn’t even finish the meal. This time around I was determined to make a biryani the entire family would enjoy. For guidance I used the challenge recipe, my friend Manu’s Hyderabadi chicken recipe and my friend Suhad’s biryani recipe. The aroma of the herbs and spices made everyone hungry as the biryani was cooking. We all had great expectations for this chicken biryani and it did not disappoint, even my four year old son enjoyed it immensely . As you go through the recipe you are likely to feel intimidated, don’t! It is indeed long with many ingredients but making it is super easy and fast. It is actually a recipe I will be using on weekdays as it comes together really quickly. Place the chicken, water and spices in a pot or pressure cooker. 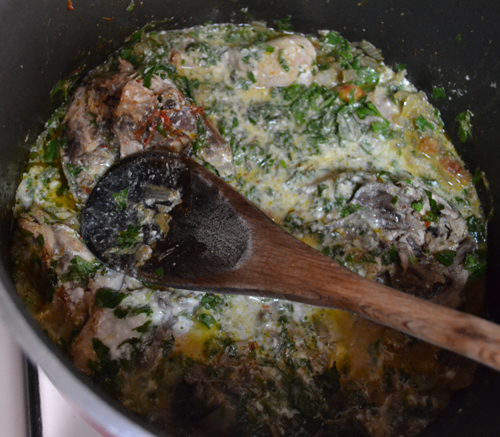 In a heavy bottom pan melt the ghee in a medium sized saucepan or use olive oil as I did. Fry the bay leaves, cinnamon, and cardamom in it until fragrant. Add the onions, garlic, ginger, tomato, and salt. Cook on medium high heat while stirring for 5 minutes or until the onions start to brown. Add the cumin, coriander powder, curry powder. Cook for another 2 minutes. Add the chicken. Cover the pan, and cook over medium heat for 10 minutes. 7. Add the mint and parsley. Cover and simmer for 2 minutes. 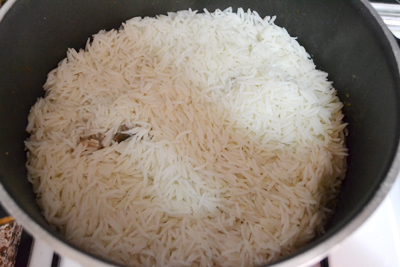 Drain the rice and place it in a pot with 4 cups chicken stock that resulted from cooking the chicken. Bring to a boil and cook for 5 minutes or until the rice is half done. Add half the rice to the biryani chicken mix and toss gently to combine. ضع الدجاج والماء والتوابل في وعاء أو طنجرة الضغط. في مقلاة ثقيلة القاع ذوبي السمن أو استخدمي زيت الزيتون كما فعلت. تقلى أوراق الغار، والقرفة، والهيل في ذلك حتى تفوح رائحته. إضافة البصل والثوم والزنجبيل والطماطم، والملح. اطهي الطعام على حرارة متوسطة مع التحريك لمدة 5 دقائق أو حتى يصبح البصل ذهبي. إضيفي الكمون ومسحوق الكزبرة، ومسحوق الكاري. و حركي لمده لمدة 2 دقيقة أخرى. أضيفي الدجاج ثم غطي المقلاة، ويطهى على نار متوسطة الحرارة لمدة 10 دقائق. إضيفي النعناع والبقدونس. تغطى وتترك لمدة 2 دقيقة. صفي الأرز ووضعيه في وعاء مع 4 أكواب مرقة الدجاج التي نتجت عن طبخ الدجاج. سخنيه حتى يغلي الماء ثم ويطهى لمدة 5 دقائق أو إلى أن يصبح الأرز نصف سواء. إضيفي نصف الأرز إلى مزيج الدجاج البرياني و حركي بلطف حتى يمتزج الارز بالخلطه. Posted in Chicken, Daring cooks and tagged a byriani recipe that is not too spicy, Biryani, biryani recipes, chicken biryani, daring cooks, dinner, herbs and spices, indian recipes. Bookmark the permalink. Assalamu alaikum. I can’t wait to try this recipe, might even give it a whirl today. 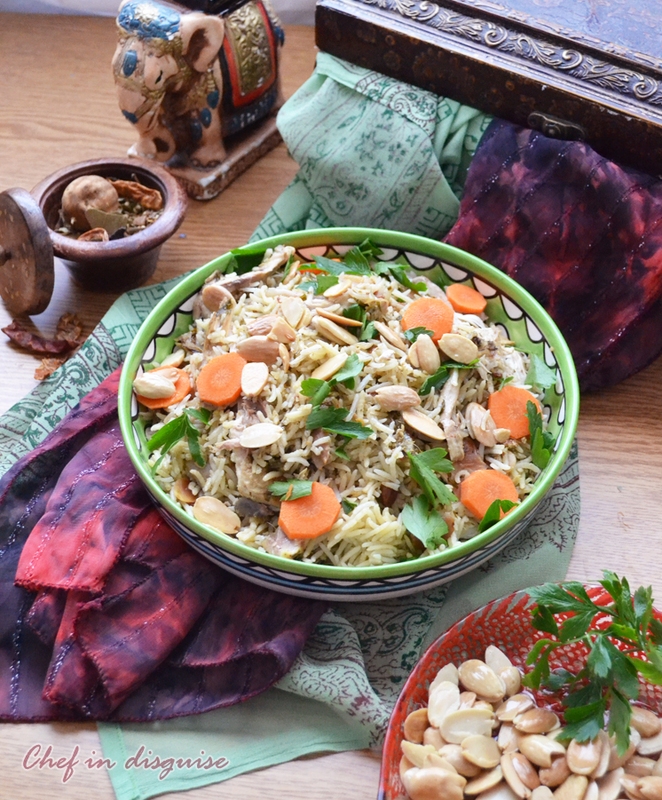 I’ve been looking for a good biryani recipe, so we don’t have to resort to going to get Yemeni biryani (although I do love Yemeni biryani as well). I’ll let you know inshaa Allaah if I make it. I’m sure I’ll love it. This was my first time making biryani – and I agree, although the ingredient list was long, once you start making it you realize that it is not so intimidating at all. haha.. I know what you mean.. the aroma that invades your home while the biryani is being made.. is frankly, just insane. and if you are hungry, its pure torture!! I like the variation of saffron rosewater mix.. very interesting.. should keep it in mind for the next time! lovely!! I went out for dinner last night with 8 women at a local Indian restaurant. I can’t wait to give your biryani a try, Sawsan. I love biryani and your recipe sounds and looks wonderful. Great job Sawsan! Biryani looks perfect. My family is from Hyderabad, India, the city of the famous Hyderabadi biryani. I make it every couple of weeks and so when I saw this months challenge, I passed! I wanted to make a shrimp one but with Ramadan ending and all the festivities, I just ran out of time. Great job with the challenge. I have a Hyderabadi one on my blog if you want a different challenge one day! Absolutely gorgeous, Sawsan! I also made the chicken Biryani. Though delicious, I couldn’t make it look even close to yours. I see that you first cook the chicken in a pressure cooker. I noticed that mine could have cooked a little longer. will try that next time. 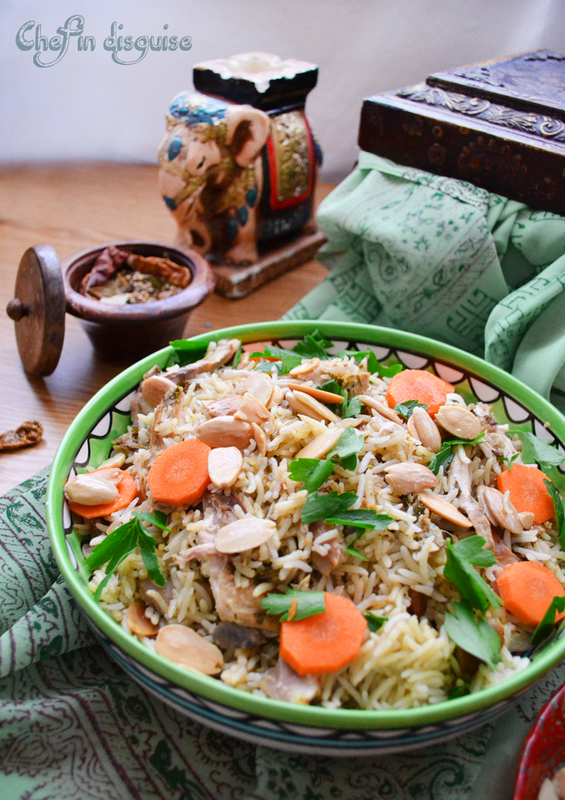 The combination of the spices in this dish sound and look absolutely mouth watering Sawsan. You’ve done a really wonderful job in conveying the comfort of this dish. It even looks like something we would love to eat during the summer, not saucy but full of flavour. I haven’t made chicken biryani in years. I keep meaning to but then I get distracted by other dishes. Your recipe looks wonderful. I’ve used leftover drumsticks and thighs from making tandoori chicken in the past rather than cooking my own chicken from scratch to save time. Good idea to make your own spice mix so you could tailor it to your family’s tastes. 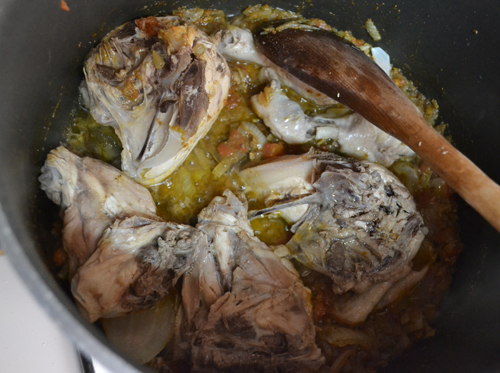 Loved this recipe, Sawsan – I wondered if you removed the chicken skin before pressure cooking it? I don’t like the texture of the skin unless it is roasted, so I should probably remove it after the first cooking? Looks like a winner. I pinned it and hope to try it. 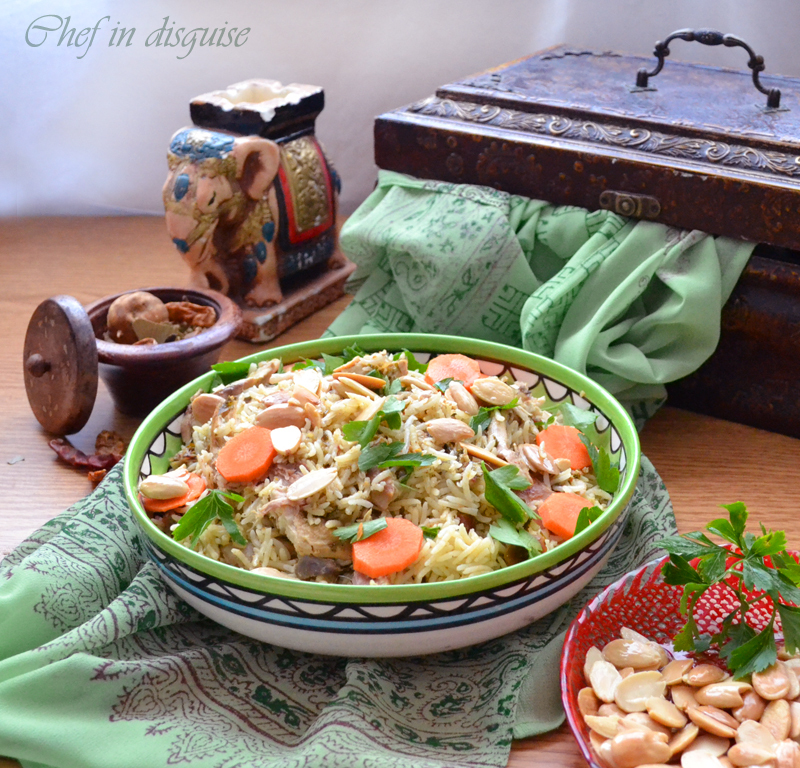 Your chicken biryani looks so beautiful – I love the added color! And I am so glad that your family enjoyed the meal. My kids weren’t quite as receptive to it as yours, but the adults loved it! This sounds delicious, Sawsan, with so many great flavors in the dish. I’d have to do a little shopping first but if it’s as good as you say, those herbs and spices will certainly get used. 🙂 Thanks for sharing. Very much like the sound of the chicken but just have to try the biryani soonest: a tad different from mine here and there and would really love to try it your way . . . hope your sleeping hours getting back to normal past Ramadan . . . tough one this year . . .
once again you given to me yummy chicken biryani 😀 and veg biryani taste same like Chinese rice i m right ??? I’m glad I found the Chef in Disguise blog! This recipe sounds delicious. Looks so yummy. I love beriani, and like to try every recipe, will try this one too. Wonderful photos, makes your Biryani look so appetizing. This are definitely my flavors. Thank you for sharing. This is certainly an interesting way to cook chicken and rice. There is practically nothing about this that I couldn’t eat. Yum! I made this the other day and it was delicious. I used coriander and forgot to buy saffron so used a few drops of red food colour instead. Finally I have a good biryani recipe to make at home, jazaaki Allaahu khayraa Sawsan. I’ve never heard of biryani before. It does have a lot of ingredients, but so many good recipes do. I bet this one is worth the effort! Ooooh! YUM! Another wonderful recipe to book mark. The flavours in this look amazing! Yep, I’ve got to make it! Looks great Sawsan – I never tried making a biryani before… Indian cuisine in general isn’t something I make an awful lot… it’s so much easier to let the “professionals” do it and go to an Indian restaurant, lol! looks like a lot of stuff in there that looks healthy! yummmmy! Its so delicious, thank you for sharing…….my family loves it. So many beautiful ingredients here Sawsan; particularly the rosewater and cardamom pods. I’ve been making lamb biryani a bit recently and although my boys love it they’re getting bored with the same flavours. Definitely going to give yours a try for a change. Love the step-by-step instructions and lovely photos, as always! yumm, looks delicious, What kind of curry powder do you use?